Ever struggled with the problem of converting redshift into parsecs, your worries are over thanks to a new cosmological distance chart based on the very latest data. Examine the light from a distant galaxy and you’ll notice that it is significantly different to light from nearby stars: its wavelength will be increased or shifted towards the red part of spectrum. This so-called redshift is the result of an object’s movement away from us–you can hear the same effect in the pitch of police car sirens when they move past us at speed. Redshift plays a hugely significant role in astronomy. Early in the last century, the astronomer Edwin Hubble noticed that the amount of redshift was proportional to an object’s distance. So more distant objects have a bigger redshift. That’s an extraordinary discovery because it clearly implies that the universe must be expanding. It also means that objects with bigger redshifts must be older. Today, astronomers often do away with traditional distance measurements entirely, never mentioning kilometres or even light years. Instead, they talk only in terms of redshift. For example, the most distant galaxy, known as UDFy-38135539, has a redshift of 8.6 and dates from some 600 million years after the Big Bang. The cosmic microwave background radiation, which is made of light emitted 379,000 years after the Big Bang, has a redshift of 1089. And the yet-to-be-observed cosmic neutrino background, emitted just 2 seconds after the Big Bang, should have a redshift of 1010. But how far way are these objects in kilometres or light years? If you’ve ever tried to convert redshift into kilometres, parsecs or light years, you’ll know the task is fraught with difficulty. For a start, the calculation depends on the model of the universe you use, whether flat or expanding for example. Then there are the actual parameters of the model that need to be measured from the universe itself, such as the value of Hubble constant. Not even Google does this kind of distance conversion. Today, all that changes thanks to the work of Sergey Pilipenko of the Astrospace Center of the Lebedev Physical Institute in Moscow. Pilipenko has taken the necessary parameters from the latest Planck telescope results, unveiled last week, and has plugged them into a standard model of the universe called Lambda-CDM, which includes the effects of dark energy and cold dark matter. 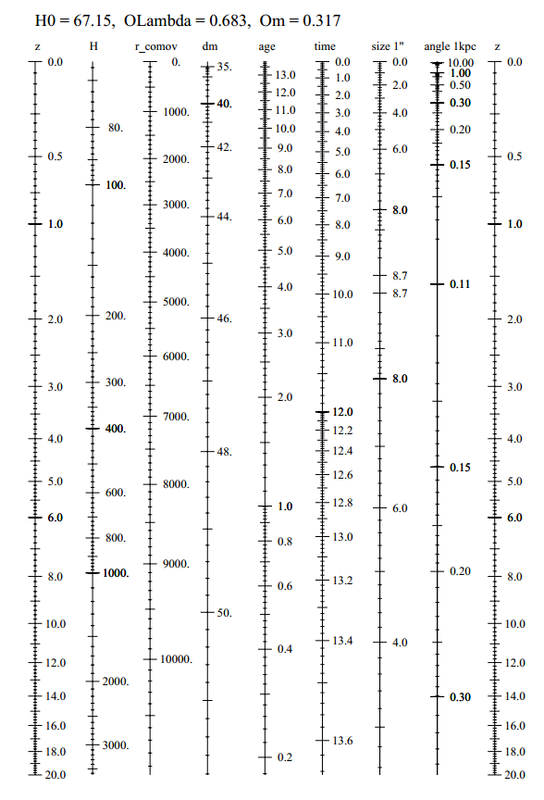 The result is a series of simple charts showing the relationship between redshift, parsecs, age and a few other parameters. (He’s even made public the code that performs the calculation.) The chart above shows the relationship for redshifts less than 20. For a closer look follow the link below.